Exotic Dancer caused a 16/1 upset when collecting the feature of The Open, the £110,000 Paddy Power Gold Cup on Saturday 11th November 2006. Owned by Sir Robert Ogden, trained by Jonjo O’Neill and partnered by Tony McCoy, the six-year-old was still at the rear at the top of the hill but came with a strong late run to challenge Vodka Bleu at the last and went away to win by three lengths from that rival with New Alco half a length back in third. 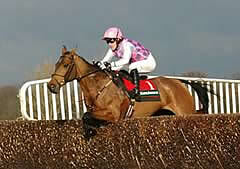 Tony McCoy commented: “He jumped brilliantly all the way. “I told Sir Robert Ogden that he was very disappointing and just didn’t finish his race at Carlisle last time and that is why I decided just to ride him today to get him round - if it all went wrong it would be my fault! “I don’t think it was a great ride - I think it just happened. He was more relaxed today. Jonjo O’Neill added: “He’s a funny old horse. We always thought he was good but he’s proved disappointing and frustrating - this was only his second win for us. “He’s had a few problems and fractured his pelvis last year and we left him for the season after that. “This year he is a stronger horse but is still a bit of a character;. “When he’s good, he’s good - it’s just that he is not always on a going day. Tony McCoy, partnering his fourth Paddy Power Gold Cup winner, said after his decisive victory on Exotic Dancer: “Before I went out I talked to Sir Robert Ogden, the horse’s owner, and told him I was very disappointed when I rode Exotic Dancer at Carlisle on Monday. The horse did not finish his race. “I said I was going to ride him now to run well. I said if I give him a bad ride, I’d accept that for him to finish. I don’t think I gave him a good ride just now - it just happened for him. “He relaxed today - in the three-runner race at Carlisle the other day he was keen. I put him in my 10 to follow in the Telegraph because I thought there was a nice race in him. His other Paddy Power Gold Cup winners have been Cyfor Malta (1998), Lady Cricket (2000) and Shooting Light (2001). Maintaining continuity is the watchword at Pond House Stables following the retirement of trainer Martin Pipe, and the yard’s wonderful Paddy Power Gold Cup record was given another endorsement by Vodka Bleu. Following an injury layoff of 714 days the odds were against Vodka Bleu, who was sent off the 4-1 favourite and finished three-lengths second to Exotic Dancer and half a length ahead of third-placed New Alco. David Pipe said: “He’s run a fantastic race and it looked like he was going to win turning for home, but then you could just see AP creeping closer - the winner has improved from his Carlisle run [on Monday]. Ferdy Murphy, who trains New Alco, said: “He wants three miles and stayed on all the way to the line. A stronger gallop would have suited him. Our Vic provided Martin Pipe with his eighth Paddy Power Gold Cup success last year when the seven-year-old, partnered by Timmy Murphy, came home two and a half lengths clear of Monkerhostin. Martin Pipe's superb record had previously seen him win the Paddy Power Gold Cup with Beau Ranger (1987), Challenger Du Luc (1996), Cyfor Malta (1998 & 2002), Lady Cricket (2000), Shooting Light (2001) and Celestial Gold (2004). However, Pipe will not be adding to that tally this year, having announced his retirement from the training ranks on the final day of last season. It will be up to his son David, who has taken over the reins at Pond House in Somerset, to continue the family tradition in the Paddy Power Gold Cup. Tony McCoy is the most successful current jockey in the Paddy Power Gold Cup with three victories. The record-breaking rider triumphed on Cyfor Malta in 1998 and followed up two years later aboard Lady Cricket. He went on to secure a third success in 2001 on Shooting Light. Following Shooting Light's victory, McCoy joined Richard Linley and Richard Dunwoody who both achieved three victories in the race during their riding careers, as the most successful jockeys in the history of the Paddy Power Gold Cup. The popularity of Cheltenham's Open Meeting increases each year with the Irish. One of the great strengths of the three days is the relationship which draws Irish-trained horses and racegoers. Both Cheltenham and Paddy Power are keen to continue this tradition. Last year there were 61 Irish runners over the three days, including four winners. What they now want is an Irish victory in the Paddy Power Gold Cup, with the last one having been achieved 26 years ago. In the 1990s Toranfield (1991) and Second Schedual (1994) came second and Anabatic was fourth in 1996, while Feathered Leader finished third in 2000. This year sees the 47th renewal of the first major contest of the National Hunt season, the Paddy Power Gold Cup. The race, run under its present title for the first time in 2003, was known as the Thomas Pink Gold Cup from 2000-2002 while Whitbread, under their Mackeson brand and then subsequently Murphys, backed the first 40 runnings. Over the three days of The Open last season, there were four Irish-trained winners from 61 runners - 30 more than in 2004 - including Independent Newspaper Novices’ Chase victor Accordion Etoile, who had also won at the meeting the previous year in the Greatwood Hurdle. Despite the competitiveness of the Paddy Power Gold Cup, it is not a race for outsiders. 31 of the 46 runnings of the contest have been won by horses returned at odds of 15/2 or less. However, the overall record of favourites is not that great, with only 13 having been successful during the history of the race, though four of the last six runnings have gone to the market leaders, with the latest being Our Vic last year. The shortest-priced winner in the history of this prestigious contest was Dunkirk who went off the 11/10 favourite in 1965, while the two longest-priced horses were Chatham (1970) and Senor El Betrutti (1997), both returned at 33/1. The incomparable Arkle made his British racecourse bow in the Honeybourne Chase on the Saturday of The Open meeting 44 years ago. It was a fantastic day for Arkle’s trainer and jockey, Tom Dreaper and Pat Taaffe, who, following Arkle’s impressive destruction of the opposition by 20 lengths, went on to land what is now the Paddy Power Gold Cup with Fortria.